I persist in thinking there are perfectly flattering clothes out there no matter what dressing room mirrors tell me. I want clothes cut to compliment curves yet skim over bulges. Non-restrictive clothes made of comfortably soft material. Clothes unique enough to say something about the wearer. They’re made by Artful Sister. This woman-owned company offers hand-dyed items created by artisans in their Cleveland-area studio. Most are made of a softly draping rayon jersey with a little Lycra for stretch. The designs are nature inspired and come in a full range of sizes, many from small up to 2x or 3x. Plus they offer free delivery and free return shipping. When Artful Sister offered me the chance to try a few samples I agreed, but warily. That’s because clothes rarely live up to my expectations. So it was a surprise to be pleased when I tried them on, an even bigger surprise to feel wonderful wearing them. Their tops and tunics look amazing with skinny jeans or leggings. I may be short, but I love how well the Taylor tunic works for me. It has become a favorite. The Nora top can be dressed up with a jacket for a meeting or dressed down for the weekend. And I can’t help myself, I wear the Tessa top all the time. 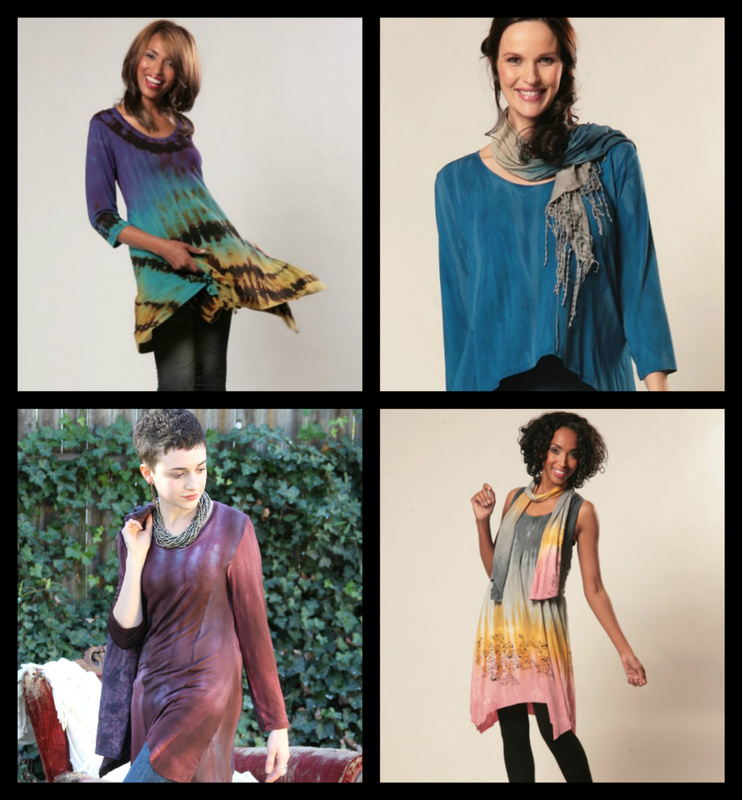 These shirts are perfect for a nursing mom, a busy professional, or an inveterate traveler. I’m also a fan of their clever tunic extender, making any top long enough to wear over leggings. Their scarves are lovely. They even repurpose the fabric their dye team uses to protect work surfaces, turning splattered drop cloth into totes, bags, purses, and clutches. If you keep up with Artful Sister via Twitter, Facebook, or newsletter (sign up at bottom of their home page) you’ll get advance notices of pop up sales. These happen every week, showcasing new designs in limited edition pieces, and are available for only three days. The news gets better. Artful Sister is extending a discount to GeekMom readers. Get 25 percent off your next order (one coupon per customer) when you use coupon code GeekMom25. This offer is valid through April 30, 2013. I’m heading over to their site now. I’ve got my eye on the Paris tunic.